Dr. Frederick Harris is currently the Director of the Wind and Jazz Ensembles at the Massachusetts Institute of Technology (MIT). He has been awarded several high musical honors including being named the James A. and Ruth Levitan Award for Excellence in Teaching in the School of Humanities, Arts, and Social Sciences at MIT (2013), being featured in the Emmy-winning PBS documentary Awakening: Evoking the Arab Spring Through Music (2014), and earning Downbeat magazine’s “Best Albums of 2015: Masterpieces” for the work Infinite Winds. In addition to submitting articles regularly to OehmsClassics, The Classical Cleveland Orchestra, and The Minnesota Orchestra, Dr. Harris has written two books; Conducting With Feeling (2001) and Seeking the Infinite: The Musical Life of Stanislaw Skrowaczewski (2011). 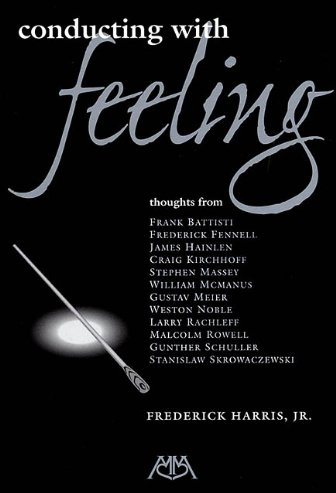 Conducting With Feeling is described by Meredith Music as “a thought-provoking collection of ideas by today’s leading conductors.” In the book, Dr. Harris has woven together advice from multiple esteemed conductors including, Frank Battisti, Frederick Fennell, Craig Kirchhoff, and Gustav Meier. The work explores a conductor’s preparation of and emotional connection to a score and is a valuable resource for musicians of all levels.